1. An editorial cartoonist often uses humor to illustrate a news item. What recent news item is Lisa Benson illustrating in this cartoon? 2. What point is Ms. Benson making in this cartoon? 3. What idiom does the cartoonist illustrate in this cartoon? What does this idiom mean? 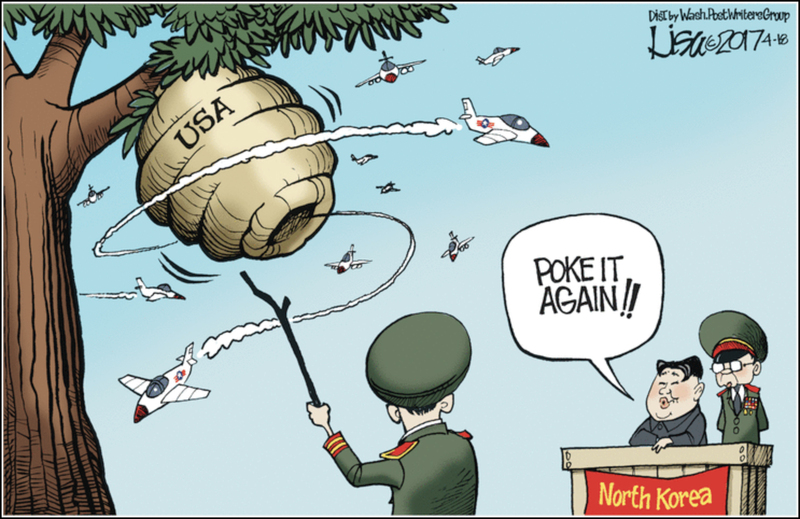 Provoking the U.S. under the Trump administration will result in a strong military response from the U.S.
To “stir up a hornet’s nest” means to make trouble, to initiate a crisis, to provoke an angry reaction; to cause a situation that makes people very angry.